The decision to close an embassy and order departure of diplomatic personnel is a signal of last resort that bilateral relations are damaged and unlikely to improve soon. 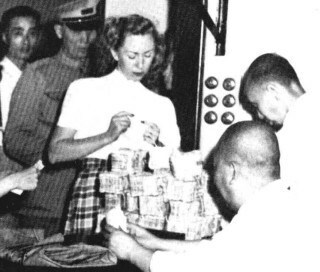 This occurred in China when Chiang Kai-shek’s Nationalist Party fled the capital and retreated to Taiwan on December 8, 1949 in the wake of Mao Zedong’s establishment of the People’s Republic of China (PRC). The U.S. chose not to establish relations with the Communist PRC and the new government refused to acknowledge American diplomatic status, so the U.S. Embassy and consulates closed their doors and staffs departed. Some Foreign Service personnel had little trouble leaving their posts and were soon heading home, but others were delayed and subjected to what they termed “games,” to their amusement and dismay. John Wesley Jones was the Political Counselor in Nanking, China when the city fell to the Communists in 1949. He was interviewed by Horace G. Torbert beginning in May 1988. Larue R. Lutkins recounts his flight from China when he was the Consular Officer at Kunming. He was interviewed by Charles Stuart Kennedy beginning in October 1990. Earl Wilson, who was at the time an Information Officer for the United States Information Service (USIS), describes his experience when he tried to leave China; he was interviewed by Lewis Schmidt beginning in 1988. Please follow the links to read about the Civil War in China, the Communist takeover of Nanking, and to learn more about China and evacuations. JONES: April of ’49, yes, that was when the Communists took Nanking. And in September I received orders to report to the Department of State… We had a much smaller staff, of course, by this time because most of the staff had been taken by Lewis Clark to Canton. But we did have enough of a staff to keep this little section and what was left of the Embassy in Nanking going and what we did was report. We were permitted, interestingly enough, to send out coded messages and to continue to use our communications system. We were permitted to continue to communicate with Shanghai and with Canton and with the Department on what was developing in this area and what our British and French and Italian colleagues were doing. As the Communists moved south and took over Shanghai and then moved on toward Hong Kong, the Department decided that it should close its mission in Nanking, and this decision was taken along with most of our allies, including the British government and the Italian government. I can remember when I went to the Chinese Communist authorities in Nanking to get passage from the country and my train ticket to Shanghai, I showed them my diplomatic passport and I said that I was the American Chargé d’Affaires in Nanking. And they said, we don’t recognize you as the Chargé d’Affaires. We do not recognize your government or any of its officials. But we will give you a permit, a pass, as an American citizen living in China, to get to Shanghai. 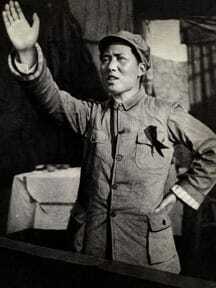 So I left Nanking as Mr. Jones, as a non-official of the U.S. government. 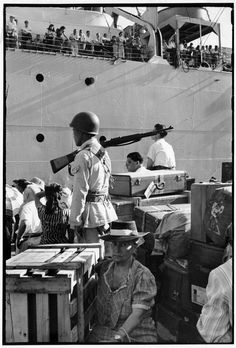 When we got to Shanghai we still had a Consulate General there; they had not all been evacuated, some of their staff went out with us. I’m afraid I don’t remember the name of the ship now but in any event we went on an evacuation ship to Hong Kong, which was still untouched and still a British colony. The first class on the ship was for the Chiefs of Mission. Since I was the Chargé d’Affaires in Nanking and Leo Lamb was the Chargé of the British Embassy, we and the Italian Ambassador were all put in one cabin, which I think had four bunks. So first class was four bunks and the poor Third Secretaries and Vice Consuls were down in the hold of the ship. I went down once and decided I never wanted to go down again. When I got back up, I couldn’t really complain about four to a cabin. LUTKINS: Things deteriorated badly in the course of 1949. Nanking fell, and the government evacuated to Taiwan. In territory unoccupied by the Communists, that left three Consulates: Chungking in Szechuan; Kunming in the southwest; and Canton down in the south. We, of course, still had our Consulates in Communist-occupied areas, which weren’t closed down until 1950. But the department in Washington was, in effect, engaged in some soul-searching as to what the position should be with respect to Chungking and Kunming and Canton. I think part of the Embassy relocated to Canton briefly before going on to Taiwan. But for awhile, the decision was to hold on and keep those Consulates open — Chungking, Kunming, and Canton — and await developments. Later on, about July of ’49, we got a message from Washington advising that it would probably come down to closing down the posts, and instructing us to start making preparations. One of the steps ordered was to evacuate all dependents. My wife and two young children and the vice consul’s wife were sent out. I think that was early September of ’49. And then we were told to go on a standby basis and make all preparations so that we could get out on short notice. Meanwhile, elsewhere in China, the Communists were continuing to advance. And it became clear that the local government in Yunnan would have to decide what they were going to do: whether they would turn over to the Communists or try to maintain some sort of resistance. 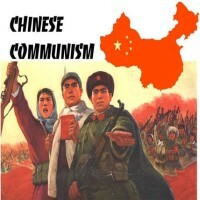 I was approached by a leading local citizen, who obviously was speaking on behalf of the local power structure, including the governor, asking if they could count on American support if they tried to resist the Communists, and whether we’d be willing to put in any military forces and so forth. The expected reply came back that under no circumstances would we be prepared to do that. So when they received that answer, obviously they had to start thinking in terms of saving their own skins. Arrangements were finally made to close up the Consulate early in December. I and my vice consul were all set to fly out to Hong Kong. 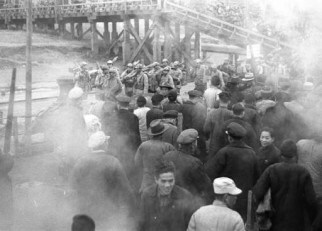 However, the day before our scheduled departure the local Yunnanese power structure staged a coup against what remained of the rather limited national government force there. I guess it was mostly Air Force. They took over the city and the airport. There was a lot of firing going on, although I don’t think there was much in the way of casualties. The city was under martial law and the control of the local forces. I managed, through one of our local employees who had very good connections, to get through to the governor, who assured us that we would be allowed to leave safely. There were no commercial flights coming in any more, and we had to go out on Claire Chennault’s Civil Air Transport, CAT. They happened to have a plane at the airport. So the following night we managed to make our way out to the airport, through gunfire, and get out on the last flight out of Free China. It was rather exciting, a lot of turmoil going on. It turned out to be after dark by the time we actually boarded the plane. It was an old C-46, bucket seats and that sort of thing, and very heavily loaded with machinery and whatnot. And I happened to notice something under the bucket seat. There was a man there. He turned out to be one of a group of Chinese Nationalist military personnel (I’m not sure whether it was Air Force or not), trying to stow away aboard the plane to get out. Otherwise, they faced a very uncertain prospect in Yunnan. They were bundled off the plane, the ones we could find, and we finally took off. For those days, that was a very long runway, about 8,000 feet, built during the war for the Hump run. But I thought we’d never get off it. We made it with only a few feet to spare. board the evacuation ship which was sent there for all of the Western diplomats. Because once we got airborne finally, more Chinese Nationalist personnel, 20 maybe, came up from the baggage hold where they had stowed themselves. All my baggage got lost; they must have thrown it out. Anyway, it was rather an exciting exit. WILSON: In August 1949, the Communists said they would begin giving 25 applications a day for exit visas. They knew thousands wanted to leave. At night, around 2:00 o’clock in the morning, there would be long lines waiting. The first time I went, I waited eight hours in the rain. They’d open the door and let in so many. The Communists also wanted the populace to see the spectacle of foreigners lined up, sort of begging, especially the Americans. So we decided we could play that game another way. We began to go downtown late at night with camp stools, cards, magazines, sandwiches, coffee, and just sit around and enjoy ourselves. The Chinese have a good sense of humor, and many of them were amused to see us out there gossiping, munching on sandwiches, as though at a picnic. So the Communists were losing face. They said, “You have to have a guarantor to get out.” One of our employees, Tommy Dunn, was my guarantor, and I was very happy about that. I remembered that later when he was an employee of ours in Hong Kong. He said, “I have this letter here from USIS employee. You have labor problems.” So he said he had no record of any clearance. I would have to go to the Central Labor Bureau. That was over in Broadway Mansions, across Soochow creek. So I went back to the first guy, and he was huffy. Here I was caught like a yo-yo between these two officials. Meanwhile, going back and forth, the machine guns would go off, I’d duck into a doorway. I remember once–I’m tall– this short soldier with a bayonet, people all jammed together, had that damn bayonet practically in my throat. Finally, I got one of our ex-employees to go out and round up enough of them to write another letter. I gave that to the official. So that was that, or so I thought. 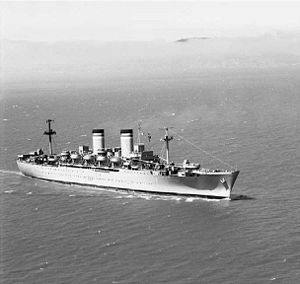 The steamship, General Gordon, which had been a troop ship during the war, finally was permitted to come and get us. They had painted an enormous American flag on the top to keep off bombers. I had sailed on her once during the war. I went down and got in line to get on the ship. He said, again, about this labor thing. But I had a copy now of this precious letter, which I showed him. I was looking at him, this one man between me and freedom. Fortunately, he let me go.